Prepare 2 cups of brown rice. While that is cooking, brown one to two pounds of ground meat* (turkey, beef, pork, lamb, or a combination of any of these). Drain the meat. In a large bowl add the browned meat and cooked rice to three cans of mixed vegetables (or one large frozen bag of mixed vegetables) and one can of pinto beans. Toss with a splash of olive oil and pinch of sea salt. I put in 4 or 5 plastic containers and freeze, leaving one in the fridge at a time. This recipe lasts about three weeks. I serve one half to one cup each morning with a tablespoon of Brewer's Yeast that I bought in the spice aisle at the grocery store. If our pups didn't get so many treats and scraps throughout the day because of the child care, I would give them a second serving in the evening. For the pups' Sunday Supper I split a small can of tuna in oil between the dogs and mix in with their normal food. The dogs couldn't wait until Sunday! The oil is good for their coat and keeps the dry skin at bay. * You can used deboned chicken, canned chicken or fish, or any meat. Crock-pot meat would be nice, too. 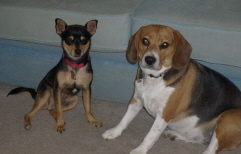 Peanut Butter and Oatmeal make great treats for the doggies. Mix a whole pound of peanut butter with enough dry oatmeal to make it no so sticky. I don't have an amount, but practice will let you know how much. 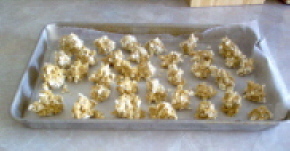 I spoon out by 1/2 teaspoonfuls and roll in more oats, then put on wax paper and flash freeze. When they're frozen I place in container or baggie and keep in the freezer. They make a great treat! * Raw Carrot Chips or Baby Carrots make great treats. * Another great treat for dogs is green beans. We keep a frozen bag just for treats. * Cottage Cheese is a great add-in to the daily dog food. * Canned or fresh pumpkin added to food will help with Doggie Diarrhea or Constipation. * Infant cereal is a great grain component that I've used in place of the oats in the treats and in daily food. Preheat oven to 350 degrees Fahrenheit. In a mixing bowl combine turkey, vegetables, garlic powder, egg, barley and oats. Mix thoroughly. Spoon the mixture into a greased loaf pan and pat down meat mixture until level. Spread gravy on top of loaf and bake for 1 to 1 1/2 hours. Cool and cut into six even slices. Store unused portions in refrigerator. If you have a dog or love dogs, you really should visit . . .